I wanted the Raleigh Pro...and so I wound up with the Romani, Robin Hood, and +1. Remember that Twenty I was planning to ship to you? It disappeared! Sorry. I didn't like the way they feel. I'm told it's that crappy fake headset, but I'm not convinced that's the only problem. Sold it, or did it really get stolen? Probably for the better, seeing as you weren't able to make it down here as you planned. Stolen, as far as I can tell. 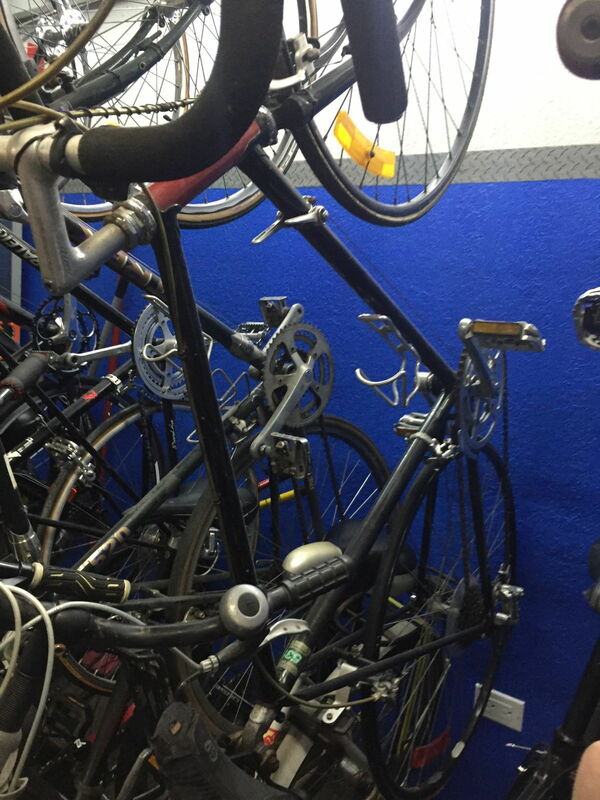 We have only 12 apartments here, and no one here strikes me as a bike thief, so maybe someone thought it was junk and tossed it. I'll ask around. I can't count all the bikes I've had stolen! Well, I could, but I can't bear to. Yes a common area in the basement. Good idea about wall hooks. I'll use a cable lock and string them together. As promised - pics of the Robin Hood and the Super Grand Prix. Well, in the absence of a Park HTS-1, may I suggest an improvised version I used a couple of years back in the Clunker Challenge? I read that a lot when I was researching about the Twenty models. Now that I have one and ridden it quite some miles, it’s what I like about it. It helps me feel balanced and in control of the bike. That’s just my situation though. I did something similar with my UO-8, and yes, those steel alloys are similar or the same. I used a cheater bar and inserted it in a small space between two concrete apartment buildings. I used the frame as a lever. I didn't do a perfect job. It was still slightly bent but not significantly. Worse, the bike didn't track straight. 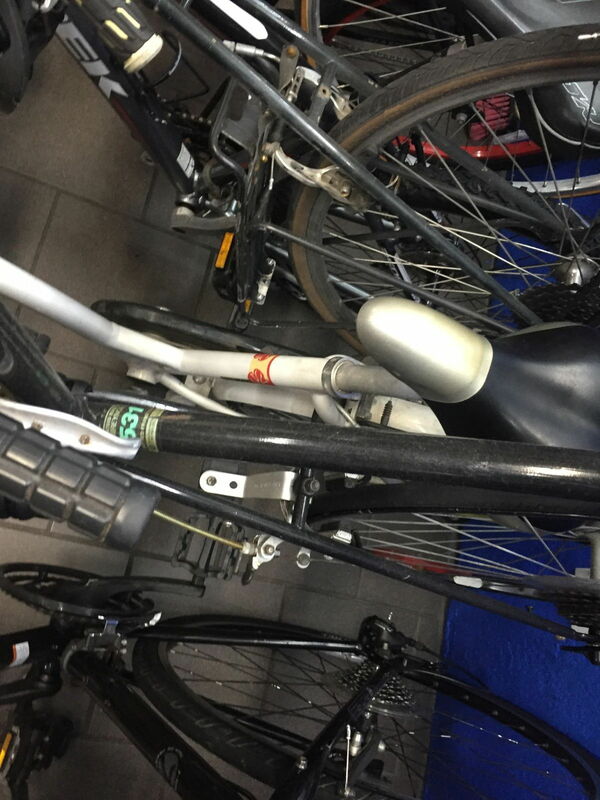 I think the head tube and seat tube were not parallel. I was able to ride no hands if I leaned a bit. But who cares? My mother had found the frame on the street and picked it up for me. It's important to keep the headset cups in when you do this. 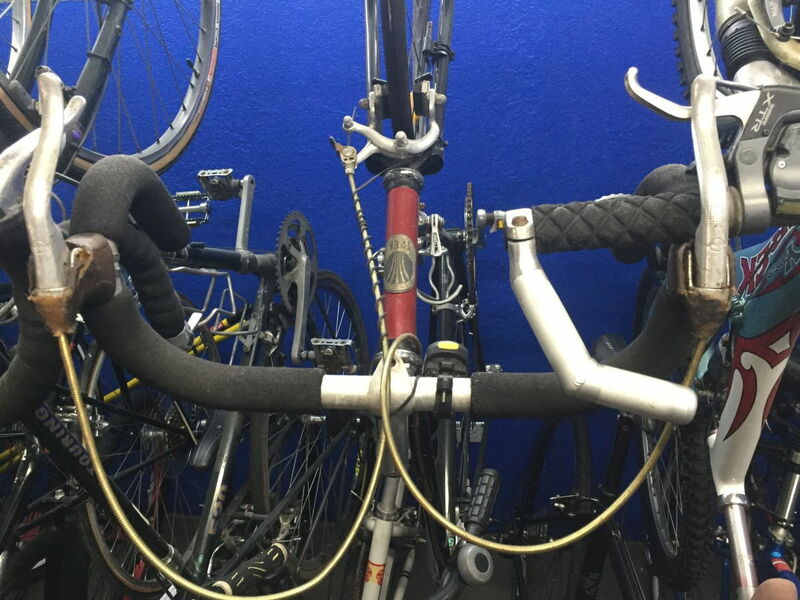 Otherwise the cheater bar ovalizes the head tube, and you'll never get the cups in. Boy, this thread has taken some turns! - I wasn't expecting to see something like that. I've got a 1-1/2" pole hole in concrete here at home which would work quite well, and I could always weld the 3/4" pipe to progressively larger shims until it'd fit tight. But I'd rather have an HTS-1 again. There's something about the combined fear and absolute lunacy of that tool that I get a kick out of. At any rate, I'm planning on junking the Super Grand Prix frame once it's stripped. I don't know what it is about this one, but it feels almost as heavy as a Varsity. Someone also drilled and tapped cockeyed holes right into the downtube for water bottle braze-ons too. The threads are pretty functional too, as the frame tubing looks like its 2mm thick if not 3mm; there's got to be 3 solid threads tapped into it. I like the quickly little ride of the Twenty over almost any other folder I've ridden. Sure, the nylon washer ruins any hands-off capability, but it's fun for what it is. Speaking of frames not on the same plane, I had to straighten one of my neighbors' relatively mint-looking Twenty frames for just that. It had a side impact at one time. Came out nice though. It seems as if whatever blue paint I found is very thin - what you're looking at is layer of primer, wet sanded down to blue, which has burned through to another layer of primer. I tried a bit more w/o wetsanding and the factory blue is down there. Very difficult to get to. Last edited by cudak888; 04-12-19 at 11:24 PM. It was midnight on a Friday night, so I decided to sit on the deck and busy myself with the top tube some more. Doesn't every normal person enjoy their Friday nights like this? By now, I knew that I was dealing with one primer coat, one coat of sprayed on touchup blue, one more primer coat, and the relatively thin factory paint below it. The top primer coat, as it seems, is relatively thick and tough. Given this information, I decided this time to attack it straight off with a worn-out 600 grit (emphasis on the "worn-out") foam sanding pad, without water. The foam does well to even out the force applied on the curved tube - very controllable. The pad is worn out enough that I can go straight to fine compound from the sanded finish. And yes, I could have continued with compound, but I can tell you right now that it'd be years before I'd see anything of it. These layers were NOT budging for compound. 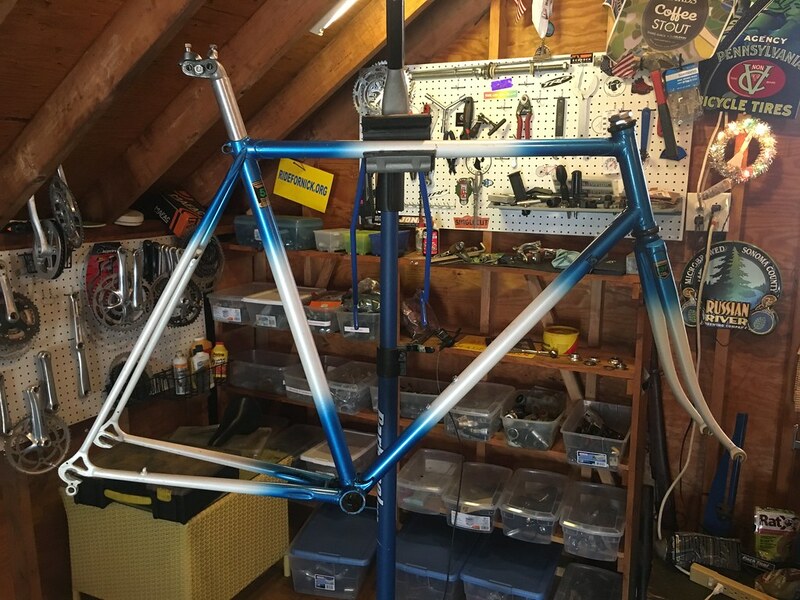 The Pro's top tube - presently a temporary member of the Salvador Dali collection - is now a smattering of layers, polished up for the forum's edification. 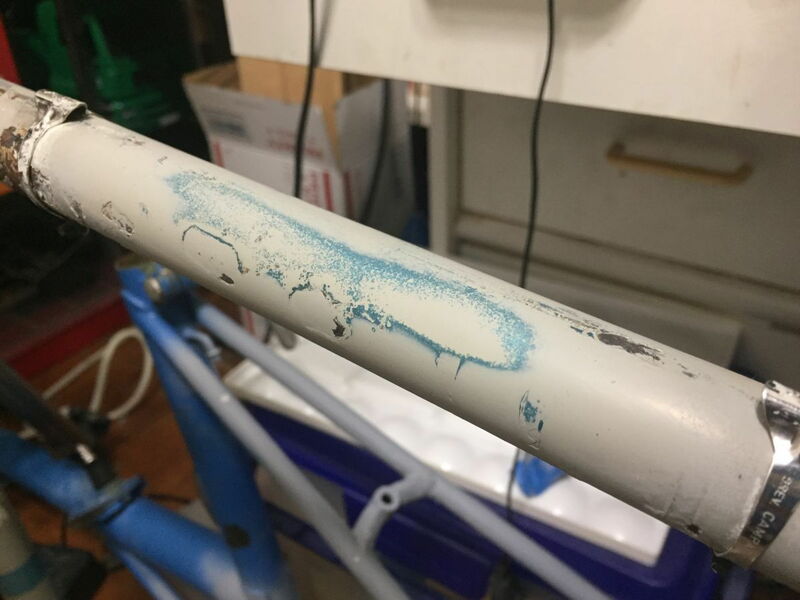 It's quite difficult to tell the primer coats apart - at one point, I thought I burned through the original paint a lot more than you see here, but the darker top tube touchup paint is quite easily detectable in comparison to the lighter, original blue. 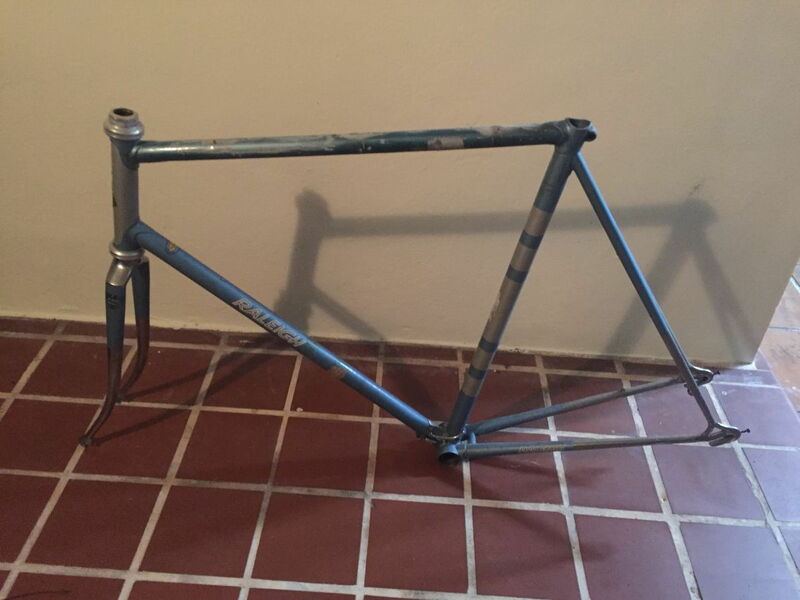 The original blue on this one is quite possibly the most "hammered paint" look I've ever seen on a Raleigh, but that comes with the lighter colors. Crappy paint, but like no other. 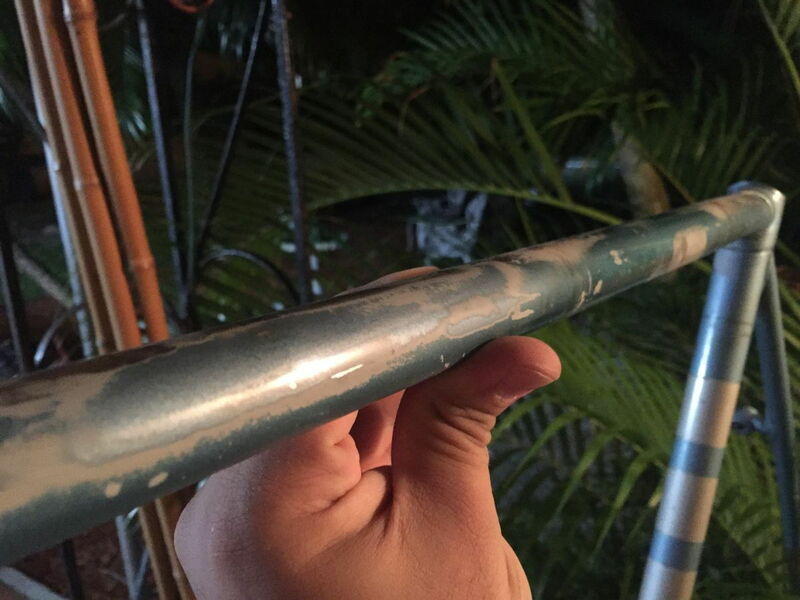 From what I can see, the paint was already alarmingly thin under the cable routing, which explains why the paint burned through to the steel almost instantly around here. The rest seems to be there - except for the obvious chips. Should be interesting to see how much of it survives. Took some photos today. Might save this comparison series for the new Headbadge website. (And yes, the yellowed, clearcoated Mink Blue of the '78 does not match the uncleared '75, though they're arguably similar if a worn bit is compared. 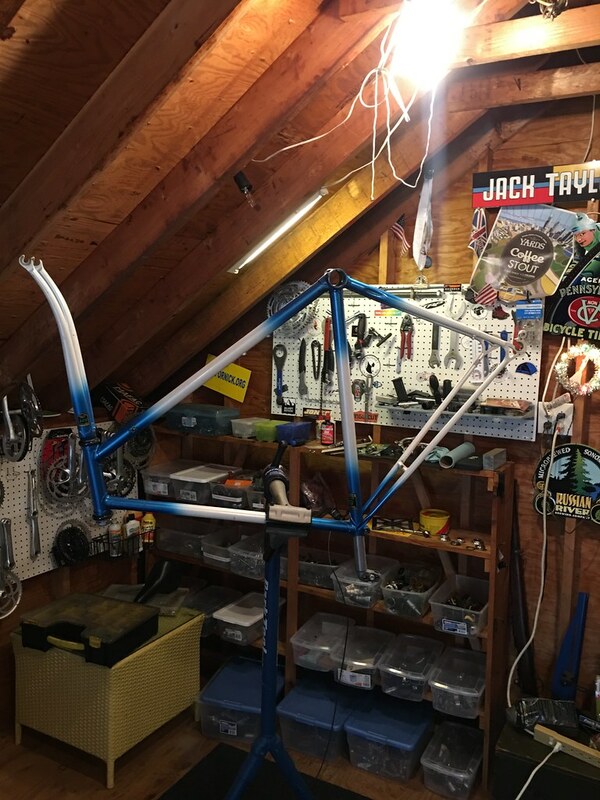 Heck, the polished bits of the '75s top tube paint winds up looking like a different hue than the rest too).
. And yes, the yellowed, clearcoated Mink Blue of the '78 does not match the uncleared '75, though they're arguably similar if a worn bit is compared. Kurt, you would know better than I, but I would not expect the 78 to match the 75. IIRC Raleigh change from Mink Blue to Steel Blue on the MkV, a bit darker blue. True? My MkIV (SN says August 1976) has, I believe both hues. Steel blue on top of Mink blue. Noticeably different colors. No sign that it was ever decaled either, no ghosts or faint lines anywhere. And it has Bocoma long point lugs. 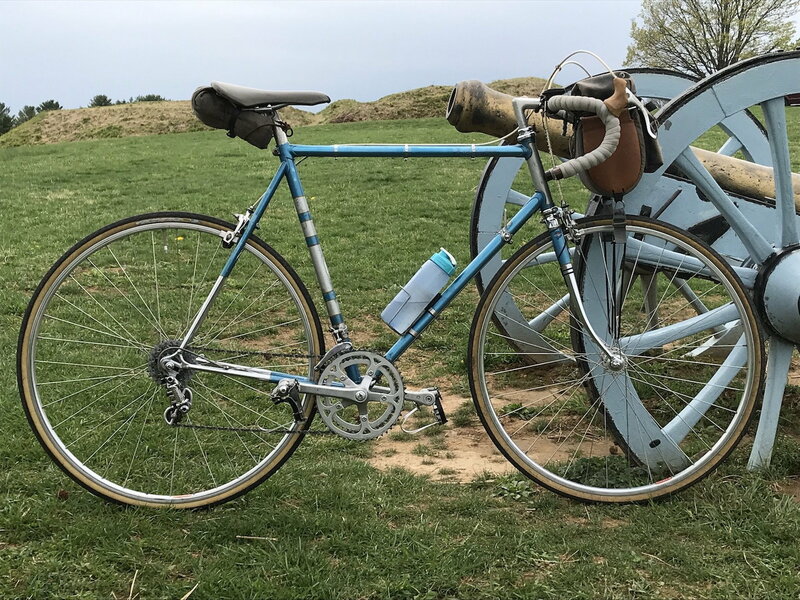 Awesome ride but another Raleigh mystery. im currently going through the same darn stuck seat post whoes with this 531 Viner / Campy Record post. what i expect to eventually happen is i head into the shop after one too many double IPA's and i ruin everything. We'll see. 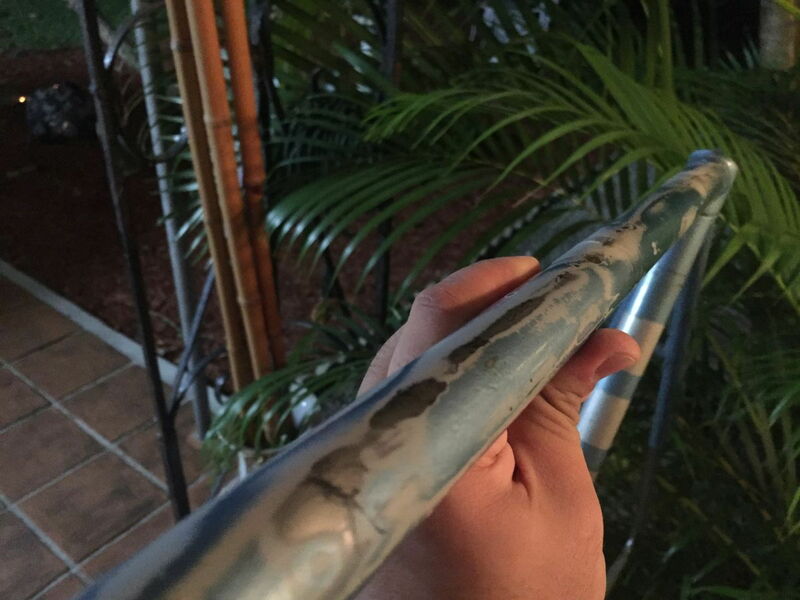 @-holiday76, check all the recent stuck seatpost threads. You would know better; I've forgotten a lot over time. Will look into it. Flip it over and put whatever liquid penetrants you have into the seattube. Let it sit for a few days. You may not break the bond, but the idea is to get liquid - however slight - working its way between the tube and the frame. Last edited by cudak888; 04-14-19 at 02:31 PM. Am I wearing a Noob shirt today? It's been sitting like this with PB Blaster in there for about a week. Have you tried any twisting motion on the NR post at all at this point? I almost wish someone made a horseshoe-shaped saddle thingamabob that would cup the head of the NR post and fit in a vise. Would allow for some twisting action and avoid destroying the saddle rail pins. Those first few pops when twisting are the most telling. 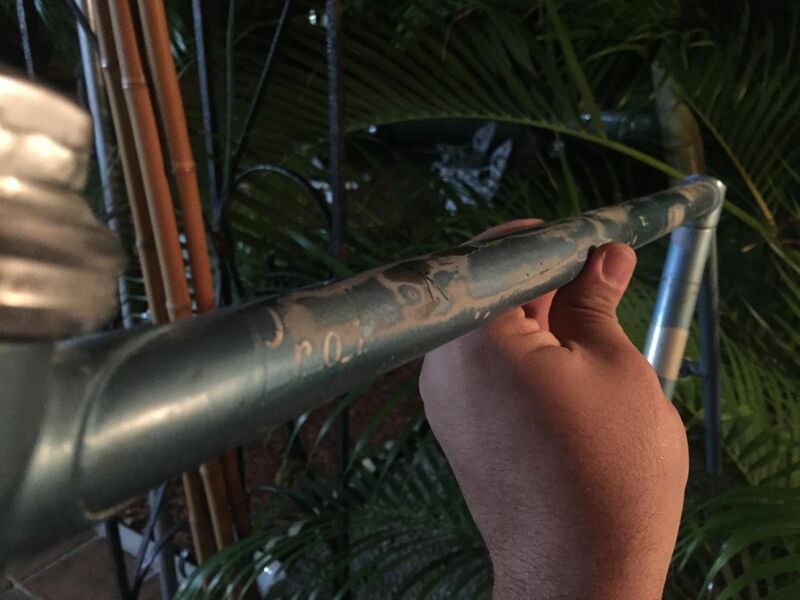 Methinks that if it's been bathing in PB Blaster for a week, the corrosion is thick enough that there isn't any space for the penetrant to get through. Last edited by cudak888; 04-14-19 at 07:30 PM. yep on the twisting. zero movement. this thing is really bonded right to the inside of the st. I suspect the top of the NR post will sheer/rip off before the post moves inside the tube. I'm already danger close to doing enough damage to the top of the post that it'll be trash. Then it's not going anywhere. There's enough corrosion that if it was 27.2 when installed, it's now 27.3 - or .4. That's the slice method if lye (and ruining the paint) isn't an option. It'd be nice if someone developed a tool for this, with a Dremel style cutter that'd slide down the post just enough so as not to nick the main tube. Probably no market for it. Kurt, I thought about you and your 'blue' Raleigh Pro today as I sailed along on mine in the spring weather. 42 miles along mostly paved rail trails with a couple miles thru sleepy neighborhood streets. Great day on a great bike. I took this photo for you. Granted colors are hard to transmit via computers but here it is anyway. 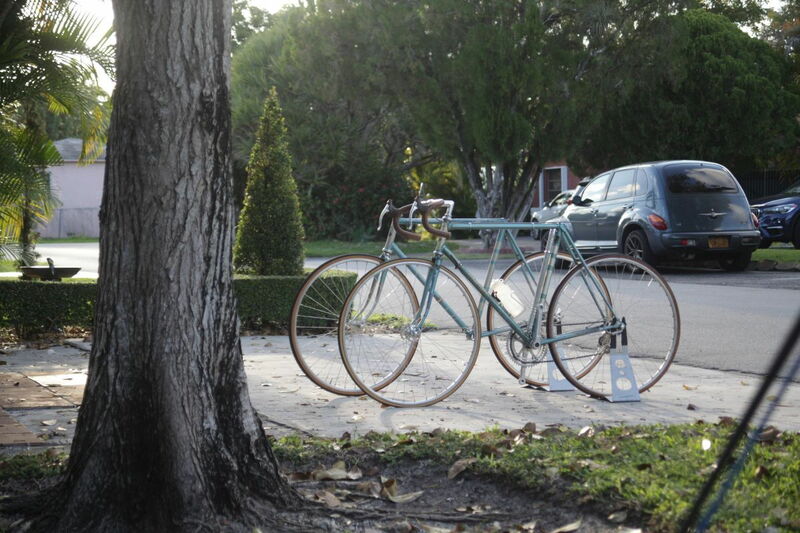 This is the darker blue that I think is the MkV Steel blue Raleigh used. A bit of excavation has uncovered two spots of the original Mink Blue under what you see here. 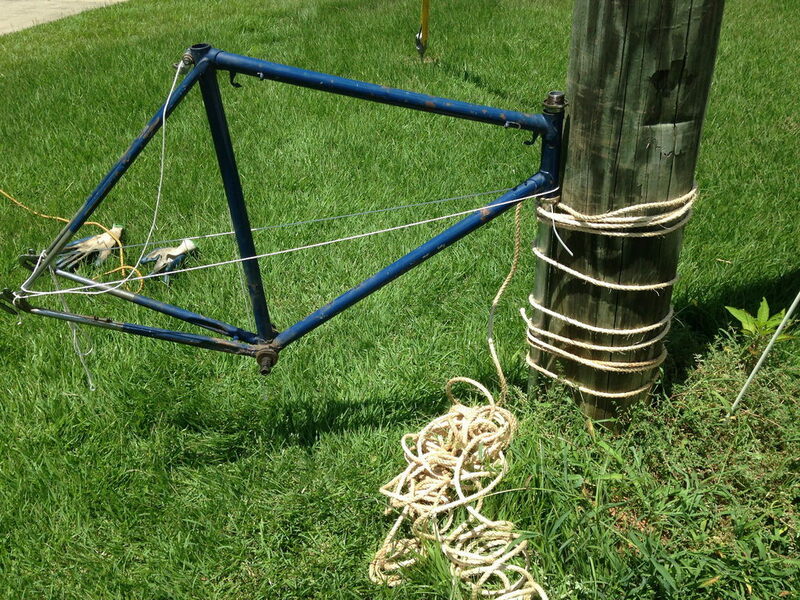 The top tube and down tube were in pretty bad shape when I got the bike. It looked like the PO had spent a lot of time on a trainer or sweated a lot while riding. 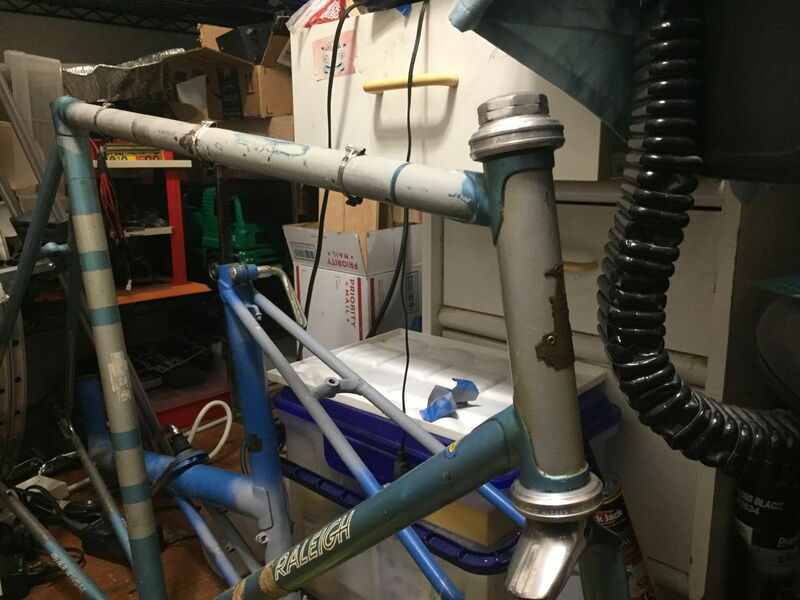 Wide spread corrosion along both tubes while the rest of the frame was pretty for a 40 year old bike. What you see here is Duplicolor GMC Maui Blue Metallic on the TT and DT. Quite acceptable for a rider and acceptably durable. I do some touch ups each fall and let it all cure all winter while the bike is off the road. Works for me. BTW: as a point of reference - I'm told that General Washington's cannon there is Mink Blue and Raleigh got the idea from him. Curious though considering how much those cannon did a mischief on the British. Last edited by Prowler; 04-17-19 at 07:21 PM.